Life Philosophy 101 for the squirrelly senior citizens: My unscheduled naps and kicking the bucket. Adopting a way to live in retirement. My unscheduled naps and kicking the bucket. I visited the doctor Monday. I had to get a cortisone shot. The doctor asked me if I was a fainter. I quickly said "No!!!" Almost as quickly my wife said, "Yes!!!!" Luckily she was there. I tend to forget things like that. In recent years I've had a tendency to take what will now be referred to as unscheduled naps. I never know what will cause it. These are usually associated with some type of discomfort, usually pain. I've had a few close calls. I don't always faint; I get wobbly. I know I am in big trouble when the picture screen in my head starts shrinking and people close to me sound like they are far away. Then it is time to find a spot to land. I don't want too much ricochet. "kerplunk!! I'm down!!! Luckily, this happened at work. I did not find a place to land, and one of my fellow employees caught me before I hit the ground. Fortunately another employee was an EMT. He had everything under control. He said, "What happened?" I answered by saying, " I don't know, I just got here myself." He answered back, "You had us worried. You didn't have a pulse." My answer was, "I assume that I do now. I'm fine." and I was, but since it happened at work I got carted away in an ambulance. My first ambulance ride. My first trip to the emergency room. Nice emergency room. They released me in a few hours. My wife made the trip from her work to the emergency room (about 40 miles) in about 3 minutes, no tickets. Wow! Not 3 minutes but fast. She doesn't even know how she found the place. I was told I had a vagal reaction. My wife said, "A Vaginal reaction?" We got that straightened out. When I first met my wife I had a couple of episodes of "unscheduled naps". I would get cramps in my legs that were very painful. It would cause me to faint. This happened a few times and after a while I could sense when they were coming and I had a few things I would do to avoid it. If it didn't work I would go with the flow. I would snap out of it quickly. 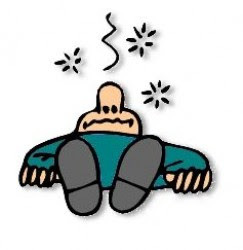 This cramp fainting has not happened in 10 years. I 've had the Norovirus twice. It is nasty. It has caused me to faint both times. The bad part is not so much the fainting. It is the fainting while your vomiting and have diahrrea all the same moment. I quite literally "Kicked the bucket" when I fainted, fell off the toilet, kicked over the "unempty" bucket in front of me. It was not pretty. My wife had it also. Same results. I am doing much better now. I haven't fainted in many days. I get a little wobbly occasionally. Most people just say, "ouch!! That hurts!!!" I just take an unscheduled nap to get rid of the discomfort. I prefer that the incidents do not occur at Walmart or Home Depot. The front lawn is ok. I hope you're much better! Well this little quirk certainly must make it interesting living with you! How crazy! Here's hoping they figure out what's causing them or you stay out of Home Depot. I've fainted a couple of times, and never in a convenient place. "Life Philosophy 101 for the Squirrelly senior citizens." selected by Pioneer Emergency Medical alarms. The birthing of John McCain. Trying to convince the world that Clint Eastwood and me are the same person. You never see us together do you? NOW GET OFF MY LAWN..... What? I don't have a lawn?